Who knows, maybe alexander finally realized it's more profitable in the long run to actually print and send the couple bucks worth of paper? It took about a month from when I placed my order with priority shipping, and I got the tracking number about 2 and a half weeks after ordering. I have to admit though this was my second try with alex. I tried the same order a year ago and nothing but silence. But reimbursed by paypal without a hassle. 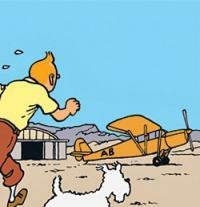 Good news, received my Brussels Airlines - Tintin decal sheet late last week! Good condition, cardboard reinforced envelope, no mixups. Luckily I'm only after the one set so I won't have to play this game of polish/brazillian roulette anymore, but it's a relief to know that there still is a chance, no matter how small, you can get that super rare sheet. And with Paypal protection, the only thing you have to lose is a little patience. How is this level of realism even possible? Very well done, you turned an average kit into a work of art! Very nice, I'll have to try this "Bondic" out sometime! Hmm that's too bad. I hope you're able to color match the vertical sabilizers without too much difficulty. Can't wait to see it finished! Wow...you've really turned this average kit into something special. Excellent job on the rollout scheme. And thanks for the links! By the way, did you design and print those decals yourself? Beautiful beluga, but it looks like you forgot the exhaust cones! Or will you be adding them after? Also are you going off of photographs for your painting or just being creative? Either way, I like it! Fair enough, looks like you know what you're doing! Keep at the great work! Not to give you any bad ideas, but I would consider removing the molded windshield wipers, polishing up with some micromesh, and then scratching something up from wire and PE. What do you think?